In the context of demographic developments such as population ageing, early retirement opportunities have been restricted and older workers are encouraged to remain in the labour force longer. Also, retirement has largely changed from a one-time permanent event to a more gradual process. This has led to a growth in bridge employment (work between full-time employment and full retirement) and post-retirement work. Although some research from the employee’s perspective exists, the organizational perspective on these developments has not been thoroughly studied. 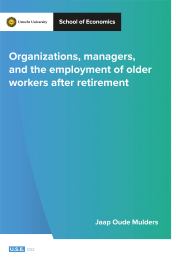 Our goal is to investigate how organizations deal with the ageing of their workforce and how this manifests itself in their policies and practices regarding the employment of (early) retirees. Also, we will investigate what considerations employers have when deciding whether or not to employ (early) retirees. We will use data from the European project ‘Activating Senior Potential in Ageing Europe’, in which employers are questioned regarding their practices regarding older employees and (early) retirees, as well as collect novel experimental data among managers and employers.